An urgent requirement for new investment into telecom and broadband infrastructure in Africa is driving a fresh flurry of deal activity across the continent, says TMT Finance. An urgent requirement for new investment into telecom and broadband infrastructure in Africa is driving a fresh flurry of mergers, acquisitions, IPOs, investment and financing activity, as the region’s key players jostle for position to meet the soaring demand for data across the continent, says global news provider, TMT Finance. 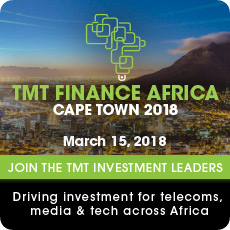 To discuss the next wave of opportunities, chief executives and leading heads of finance and strategy from Africa’s key broadband infrastructure companies, private equity investors and telecom operators are meeting on a dedicated panel at TMT Finance Africa in Cape Town 2018 on March 15. The TMT Broadband Infrastructure panel, which will discuss strategies for regional growth, includes: Brandon Doyle, CEO, Convergence Partners; Suveer Ramdhani, Chief Development Officer, SEACOM; Brian Jakins, Managing Director of Africa, Intelsat; and Thomas Hintze, CEO, Wananchi Telecom; and will be chaired by Keith Webb, Investment Banking, Infrastructure Finance, Rand Merchant Bank.